At the end of the English text book my 8th year English class and I still had a few weeks of school year left. What should we do? Read a book? Play games? I decided to do a special project; a FILM project. I gave my class a choice of different movies and was more than happy when they decided to work on "Shanghai Noon" – this meant I could combine hobby and job !!! I divided the project into three parts and I would like to give you an idea of what we did. The students had learned English for four years and were thoroughly fed up with specially made textboook material, they wanted to work with authentic texts. So I started with some of Kath's scrapbook stories about the filming of Rob-B-Hood and Rush Hour 3. They are written in good English and provide a lot of useful words and phrases. They are also informative and not at all boring, particularly the point-of-view of a curious observer appealed to my students: they felt as if they had been there themselves. I finished this part with some sequences from "Jackie Chan - My Stunts", because I wanted to show them that stunts and film fights need a lot of knowledge, skill and caution. At then end of the lesson they could say a sentence like 'A special powder is used to enhance the impact of a kick or punch.' which is something a lot of older students cannot express when you just obey the textbooks. Production: The movie "Shanghai Noon"
Usually a movie is watched as a special treat in the last lesson before the holidays. This time my students had to get used to working with it as well. I gave them worksheets with vocabulary, that had to be learned, and essay questions . After some moaning they worked well, showing good understanding of the story and the characters. The film offers a lot of topics for discussion: friendship, honour and promises, freedom and finding your place in life. All these points are interesting and relevant for teenagers. The project would have been incomplete if I hadn't seized the opportunity to include some history information : about 19th century Imperial China and the Wild West. The students formed groups, gathered information and prepared talks on the Forbidden City, Chinese Emperors, Outlaws in the Wild West, Women in the Wild West and Chinese immigrants to the USA. They found out that despite the humorous elements there are a lot of authentic scenes in this film and they learned a bit of history this way. One student, who is Chinese herself, conducted a lesson on Chinese characters and taught us some Mandarin phrases. The students enjoyed the project a lot, one of them stated that they 'had to work hard, but it was fun and we learned a lot of English.' At the beginning of the year they had gotten the task to do an American Album with stories and information. 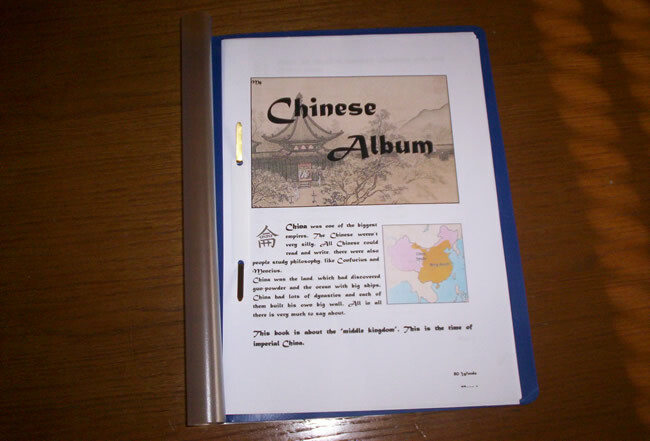 After the SN project some of them also did a Chinese Album or an American-Chinese Album, because they had become interested in China. "Shanghai Noon" is a good film for projects like this. First of all the 14-year-old boys were attracted by the fights and stunts, the girls could identify with Princess Pei Pei , and all liked the humour and the fun. Apart from that it made them think about various questions, they gained some background information and, last but not least, learned a lot of English. The film was a great motivation to practise their new words and skills . So all in all, I have to say a deeply felt "Thank You" to Kath for her excellent texts and the permission to use them, and of course "Xié Xié Ni" to Jackie Chan for making this film and thereby inspiring a desperate teacher to some good lessons.